Why does the confederation introduce a member card? Our sport is gaining popularity very quickly. This ongoing process leads to a growing number of tournaments with more and more competitors, a fact we are of course very happy about! But since we are not willing to cut back the quality of our events by any means, the necessary administrative work for the confederation is getting more complex as well. The new mandatory member card will help us keeping track of schools, instructors and fighters. Furthermore, it will guarantee the affiliation of the Swiss Confederation of Brazilian Jiu-Jitsu to the international federation. This will simplify the registration process for international tournaments considerably. How do I use the member card? Vital information about the owner like name, date of birth, team, colour of the belt or insurance type will be listed on the card. Additionally, every federation member will be given an individual number, and the school’s registration code at the IBJJF will be visible as well. Thereby, the card will identify a fighter as an official member of the Swiss federation. 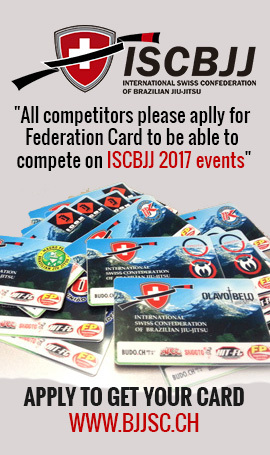 Important: As of 2014, it will not be possible to participate in any BJJ tournament in Switzerland without being a registered member of the Swiss federation and having a member card. It will be mandatory to bring the card to every event. How can I order the member card and what are the costs? The card can be ordered here* very easily and costs CHF 45.- per year. It will be supplied within two weeks. How do I handle mutations? In case changes regarding graduation or team membership occur, we ask our members to send us a short e-mail! For a fee of CHF 20.-, a new updated card will be provided. Do I need to have the card with me on competition day? Yes! No competitor will be able to compete without the official identification card. The card has to be brought to the referee table for every match. In case of loss, we ask our members to send us a short e-mail. If this happens prior to an event, please bear in mind that we will need a minimum of five days handling time! For a fee of CHF 20.-, a new card will be provided.